Finding a micro quadcopter kit is a great way for some bonding with a relative, having some time to discover the scientific side of you, and getting the opportunity to build something you love. Thinking it through slowly instead of really jumping in with both feet is the way that you will get the most enjoyment out of your machine, so you don’t become overwhelmed by going too fast. We wanted to offer the best in a micro quadcopter kit review format to give you an idea of what’s available for the hobby enthusiasts out there, and how you can benefit from purchasing a new kit. 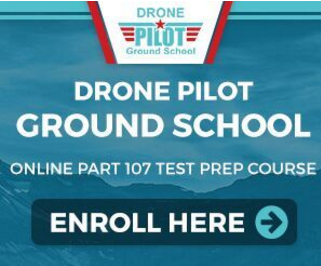 You can opt to just get a small taste and have some fun with a safe and inexpensive model, or take a more serious route and fly a higher quality micro quadcopter kit. There is nothing wrong with getting just a cheap quadcopter kit, to see if you really enjoy the building aspect: we already know you’re going to enjoy the flying! We wanted to review the best in mini quad frame elements, and give you the right resources to find a micro quadcopter build. Even among very experienced builders, there are many more failures when you try to build your own frame, and this should be considered when you are looking at anything from a micro qc frame on up to a standard mini quad frame. When you have completed a build, you’ll be thrilled, and it’s a totally different experience when you have mini race quads on hand that you had a hand in putting together. Here are some of the ones we found on our search: you can pick the one that works the best for you, and begin to build something that you’ll enjoy flying. 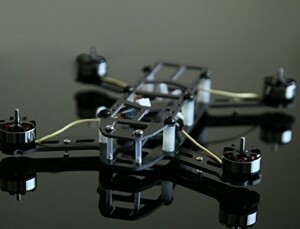 Click To Shop or Read ReviewsThis is a micro quadcopter kit frame that looks a bit like a race car on the ground, and will no doubt provide for many hours of fun. It comes equipped with 4 DP03 6500KV Motors, and weighs 14.1 grams. The motor is currently the smallest in the world that can drive 5030 propeller the right way, and with a very high level of efficiency. Test result specs on the 5-inch propeller is 3.7 V .6A 15 G thrust, and the motor has a 1.5mm pitch. Professional RC enthusiasts have said that this frame is excellent, and that it is as light-weight as you can get while being fully symmetrical. This frame is around the size of a cigarette lighter, and for camera options, you could add something like a 600 TVL Micro Cam, a 600 TVL CMOS 1/4 high clear surveillance lens, or a micro 1g cam. Click To Shop or Read ReviewsThis is a copter with a durable full-carbon frame, brushless power system, and full-featured micro MWC flight controller. A good example of the fun and awesome rec times you can have with mini race quads, it comes with spare props and 2 batteries. Onboard are the MPU6050, HMC5883L, and BMP180 sensors, and an FTDI tool for radio and flight modes setup is included. 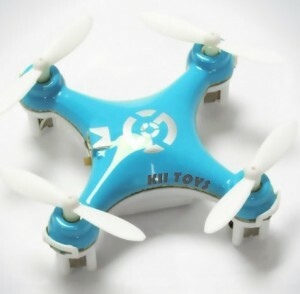 Hobbyists are loving it because it is possibly the smallest non-DIY brushless quadcopter on the market, and it can fly for an average of ten minutes if using 1400mAh/25c LiPo, and approximately 8 minutes of use if using a 1s300mAh/25c LiPo power source. Click To Shop or Read ReviewsThis is a great choice for a low-priced frame that features an X design, the most popular mini quad frame layout by most standards. With quick-release fixings aluminum mounting hardware, it allows for a much quicker swap-out of the arms, because you don’t have to remove the top plate to change them. The Usmile X design frame is made of high-quality carbon fiber, designed to sustain any nasty crashes you may throw its way. For the camera options, the angled mount is 25-30 degrees, and the frame weight is 76g. It is equipped with a rubber damper to stabilize it during flight, and is very compact and easy to lug around. The best combination that expert pilots have discovered is with an Emax Mt2204, simon 12A ESC, CC3D flight controller, and a 6045 propeller. Probably not for beginners who have never built anything from the ground up, but this is a great example of a frame for a cheap quadcopter kit. Click To Shop or Read ReviewsWhat claims to be the smallest quadcopter in the world, this is a very inexpensive model that even has features like headless mode and flipping action. 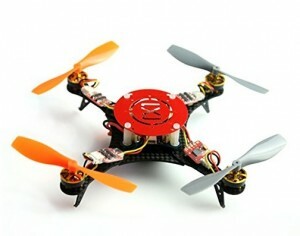 It operates on a standard 2.4GHz with fine tuning, and 6-axis design makes the gyroscope adjustable. This extra fun little guy is available in 5 colors, and its size is just 1.5 inch by 1.5 inch. The controller is a very user-friendly game style, and you can even just “throw to fly”, by simply throwing it in the air to start the flight. Charging time is around 15-20 minutes, and the control distance reaches about 20-50 meters. The battery used is a 3.7V 100mah, and the transmitter requires 2 aaa batteries that are not included. Yes, it can be kind of easy to crash something that is this small. But for the price, you get a wildly fun device that is great to fly around, get used to, and even help you through severe cabin fever during the cold months. This is a great way to get into the micro quadcopter kit world. Check out our recent post on quadcopter trackers.